In hindsight it’s easy to see we should have worked on the email template first, then the flyers. Email is our #1 way of communicating and it’s important to try to get as much out of it as possible. 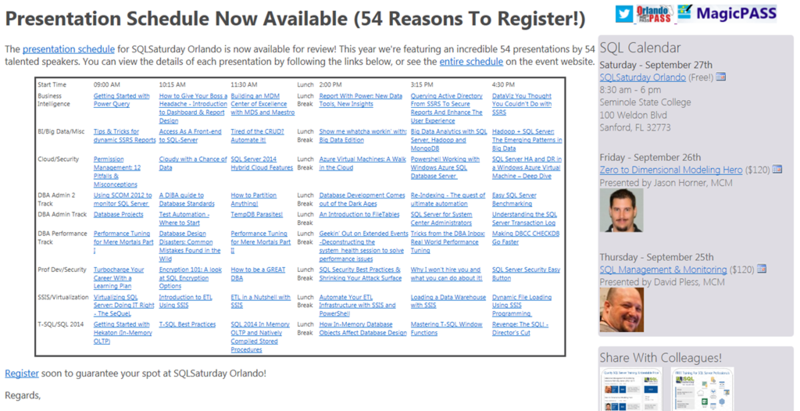 My original vision was to show the seminars as “ads” in a right hand column that would be about% of the page. I still like the idea of including them every time that way, but I’ve changed to treat them as “events” on a calendar. I think we’re trained to ignore ads. See the screenshot below. We’ll see if works out. I’d love to have a “responsive” email template that will render on everything perfectly. Short of that, I took our template and ripped out all the extra stuff and then starting adding back, trying to check that it rendered ok in IE and Chrome and Outlook. I still owe Kendal some shadows to make it a little more polished. The SQLSaturday framework supports a handful of tokens that you can embed in messages. Of those is attendance status with a payment link, I’ve put that in a HTML comment so that the email has something to uniquely identify it if it bounces back with a “new address” message – I have one I can’t figure out! We’re still on the weekly tempo, seems ok ok far and we’re still above the registration curve from last year. Kendal Van Dyke tried to forecast using Excel, didn’t get much beyond a line. Maybe it can be done, just didn’t have a lot of time to spend on it. We’re trying hard to build Twitter as a useful second channel (secondary? for now). It’s slow going, but we’re working it every day, we want anyone that checks the hashtag – especially the view on the event home page – to see an active discussion. We’re also thinking to run a contest or two to get people to join Twitter (or to share their handle). Next week is “schedule week”. The only thing we want to do is get people to look at the schedule (and then register) now that the event is truly “real”. The following week we’ll be focusing on the seminars (and by using the template, also reminding them of the event). I added calendar files next to each event. Eventbrite offers them that option too, but I think anything we can do to get them to commit the time is worth doing. I think it also goes well with the “calendar” idea. Visual Studio is a decent HTML editor (it’s what I have), but is there something better? I also like looking at the messages in print preview. I’m not going to spend a lot of time there, but it’s helpful if it will print and look like something. I’ve added the flyers to the right column, but not sure I like it – will they use it? Could I use that space better? Next task is to add a “Resources” section and it’s there that I want to add “How to Ask the Boss For Training”, “How To Get a Colleague to Attend”, “How to Network…”, “Why You Should Go to the after party”, and maybe a couple more. I think those are going to be big enough that I want to do as separate PDF’s rather than a FAQ page and I want them to download/print/share. I think we’ll brand those as oPASS/MagicPASS for re-use next year. Reminder that events can copy messages from other events, it’s built in to the tools – just browse to find something you like!